In the 1960s and 70s, the so-called Second Wave of feminism engaged with an expanded range of issues affecting women. Whereas First-wave feminism had focused on basic legal rights such as the right to vote, Second-wave feminism dealt with more personal issues such as the right to work, the right to sexual and reproductive freedom, domestic equality with husbands and partners, freedom from violence, etc. During the heyday of Second-wave feminist debates, feminist intellectuals tended to look backwards upon what they saw as an undifferentiated history of patriarchy. Before the pill, before the liberalization of the right to divorce and before it became commonplace for women to have a lifelong career (even while married)—in short, any time before 1960—anything like real equality was unthinkable. In the 1980s and 90s, many ‘feminist’ medievalists who grew up during the Second Wave argued that medieval society was thoroughly patriarchal – that is, it kept women in a subordinate place. In these histories, women have little or no ‘agency’. (We can define agency as the power, freedom, or opportunity to make the most of one’s life.) Since the 2000s, however, a reaction to this Second-wave historiography set in, one which acknowledged that medieval women had many fewer options than men, but which nonetheless emphasized the ability of women to ‘make the most of’ these limited options – sometimes, in other words, patriarchy was less absolute than it had seemed at first. Astute readers will notice that we have used the term ‘medieval women’ with the implication that we mean ‘medieval European women.’ In fact, prior to the year 2000 precious few scholars in Western universities concerned themselves with reconstructing the medieval lives of anyone—men or women—outside of (Western) Europe. There is a tendency today to blame this Eurocentrism on earlier generations of scholars themselves. I would strongly argue that this is myopic and missing the point. In fact, many scholars for a hundred years or more have themselves been progressive radicals by the standards of their day—and even those who were not notably progressive were nonetheless doing something to add to the sum total of human knowledge, or else we would not continue to read them. In fact, Eurocentrism in our narratives is largely a function of time and place. Since it was in European and American universities that the scientific study of history first began to crystalize in the final decades of the nineteenth century, and since even these universities remained extremely tiny by modern standards until after WWII, we can say that the historical profession itself is still in its infancy. And of course, the first generations of scholars would debate issues closest to home: in 1920 very little was known about medieval English society, whereas by 1980, a great deal was. It took generations of scholars to bring English medieval social history into some type of satisfactory state. In European countries with fewer resources and fewer universities, or which had been marred by totalitarianism and similarly anti-scientific regimes, it took even longer for the basic contours of national questions to take shape. In Spain, for example, which had a fascist dictator until 1976, medieval history begun in the early twentieth century was put on hold until the 1980s, and even now it has still not reached a state comparable to that of France, Italy, the Low Countries, or Britain. Thus it was sometime around the turn of the millennium, when the national histories of Western Europe began to seem too ‘done’ and stale, and the first wave of feminist history had been written and rewritten, that scholars from established universities began to take more seriously the medieval history of Eastern Europe, the Islamic world, Russia, China, and elsewhere. 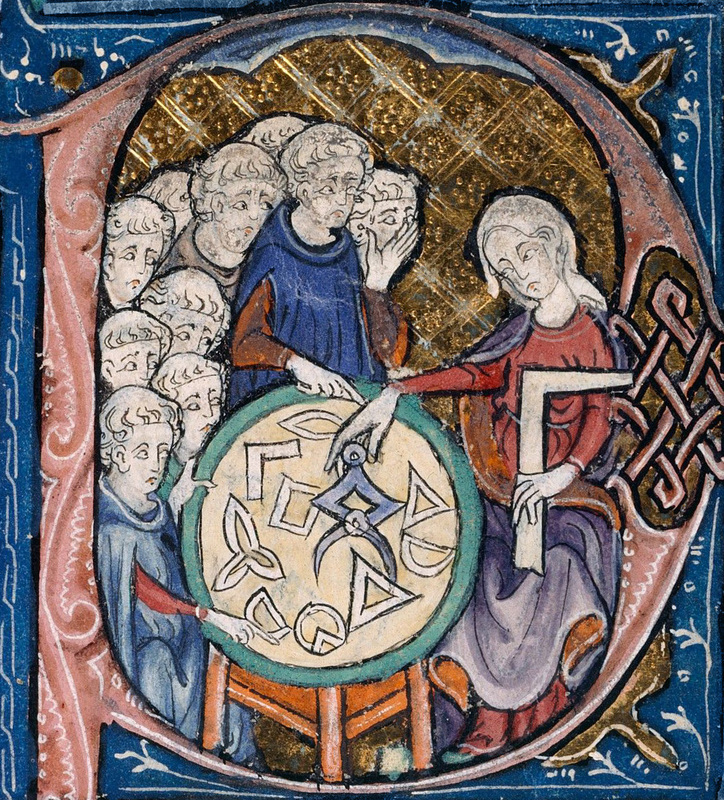 Woman teaching geometry (detail of a 14th century miniature). Source: Wikimedia Commons. ... But what do we know of medieval women’s lives outside of Europe? This work is still in its infancy. For one thing, the challenge of learning Arabic or Chinese for non-native speakers is simply much greater than that of learning a European language, due to accidents of complexity. For another thing, the concept of the university, and the concept of the history department, has only recently begun to spread outside of the ‘Western’ world. I am confident that as these new universities in Africa, the Middle East, and Asia continue to climb into the global rankings, that scholars from these universities will pursue questions of their own ‘medieval’ histories, greatly adding to our collective store of knowledge. I have made this digression because I want to point out a definite Eurocentrism on the part of Second-wave feminist writers. That is to say, they were often so concerned with pointing out the injustices in their own (European) past, that they did not take the time to look at what, say, the condition of women in medieval Islam, or in medieval China or Eastern Europe was, in comparison with women’s lives and freedoms in medieval Western Europe. The latest scholarship from medieval Western Europe suggests that women in Western Europe had a great deal of freedom, for example to own property, to be the sole wife rather than one of many, to have rights over her children and husband, to become educated, and even to participate in public and economic life. From what little we know of conditions outside of Western Europe, it looks like medieval Western European women had much more agency than women in Islamic, Eastern European, or Asiatic societies. In other words, it looks like the emergence of First-wave feminism in Western Europe and other Western societies, is predicated upon a much greater freedom for women, which they had been enjoying since at least the middle ages in Western Europe. This is an observation with profound implications – but it is one which gets almost no attention from scholars or the media. This is because this scientific observation is in fact an Inconvenient Truth: a truth that most academics, who tend towards the left of the political spectrum, are very wary of acknowledging. After centuries of overweening European pride, and colonialism, culminating in the racial hatreds and exterminations of World War II, we are loathe to suggest that European society might have been more ‘progressive’ than other societies—in any way at all. But I would argue that some specific instances of ‘things going right’ in parts of Europe for certain groups need not send us on a slippery slope to the perdition of racism and Social Darwinism. I would argue that only by acknowledging what we find as scientists, even if it is uncomfortable to our collective progressive faith, can we really find the roots of modern inequalities. For example, India has a serious ‘women problem’ (which is to say, actually a ‘men problem’) at the moment—this fact is plain to anyone. The current orthodoxy goes out of its way to twist English colonialism into a force that systematically degraded Indian women, even while British women were gaining increasing rights at home. But is it possible that some of the advantages enjoyed by British women and disadvantages suppressing Indian women actually pre-dated English colonialism in India? The medieval historian in me says: absolutely yes. But to say this in many conference rooms would be tantamount to facing an academic firing squad. 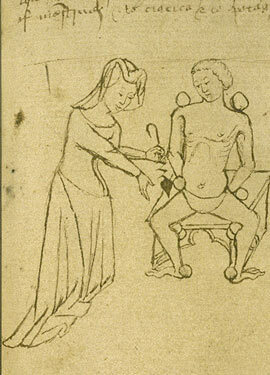 First image: Medieval female physician operating on a male patient (from a 15th century manuscript). Second image: women hunting rabbits with a ferret (14th century). Source: Wikimedia Commons. In later medieval Spain, some writers have emphasized the Second-wave feminists’ concerns, suggesting that widows were poor, that wives had few rights, and that women’s economic and political lives were restricted. And this is undoubtedly true to some extent. While women were sometimes admitted to workers’ guilds in other parts of Europe, for example, so far no one has found evidence for this in medieval Spain. But in other ways, we can find a surprising degree of freedom and yes, agency, in women’s lives, as my own researches have uncovered. 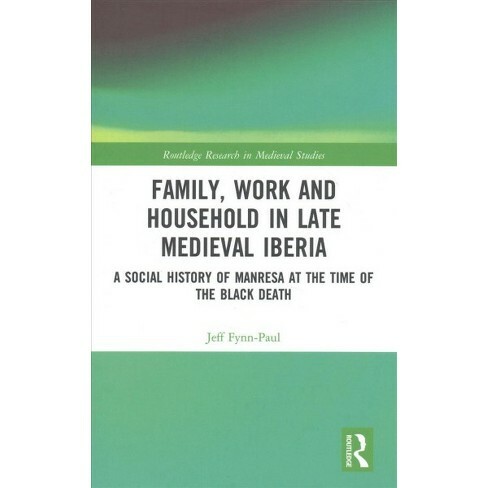 I recently published a book entitled Family, Work, and Household in Late Medieval Iberia: A Social History of Manresa at the Time of the Black Death (Routledge, 2018). In this book, I trace the histories of two families to a level of detail which has been achieved for few other medieval Spanish families outside of royalty. I was also able to look at the economic strategies of Manresan women as a whole. Especially interesting was the fact that some 15% of Manresan households were headed by women. As independent householders, these women had control over their entire households, including children, relatives, and servants. They had economic power over them, and they had effective social control. I have found that many women invested their money in loans, or else in real estate, or in projects such as mills, or in workshops. Even if they did not practice as many professions as men, they collected rents and acted as landlords or business partners. As married women, they often co-operated the household economy with their husbands. These women were all entitled to a dowry, which was legally independent from her husband’s funds, and which, importantly, had to be retuned upon her husband’s death with a 20% increase known as an augmentum. This meant that while he lived, each husband had to ensure that his own wealth grew by enough to return his wife’s dowry plus augmentum upon his death. Otherwise, his own eldest son would be denied this money, while it went to his wife. Many women inherited substantial sums upon their parents’ or husbands’ deaths, and many husbands provided generous settlements on their wives, to ensure they would continue to live in comfort after their own decease. (In this society, women tended to be 10 or 15 years younger than men at age of marriage, and so the men tended to die first: this was arguably advantageous to women, since as widows, they could achieve the legal status of a householder.) I have found that widows tended to have almost as much money as male householders, giving the lie to the myth that widows were generally poor and despised. My researches have also uncovered the careers of a few very interesting women. These tend to come from the wealthier strata of society, since surviving documentation tends to concern substantial property. The example of Blanche de Ulznelles, who became the lady of multiple castle lordships, is particularly illustrative. Blanche was born to a prominent burgher (merchant) family, and she was her father’s principal heiress. Whether by her father’s will, her own, or some combination of these, Blanche contracted to marry Berenguer de Talamanca, who was lord of Calders Castle. As lady of the castle, Blanche was able to contract business deals, receive homage from peasants, and receive delegations from the city government when they were strapped for cash and needed a loan. She was often the sole witness to legal documents drawn up regarding the lordship, and in fact she functioned as her husband’s legal representative in many social situations, including meetings with church officials. When her husband died in 1364, Blanche assumed full lordship of the castle, and became the ward of her underage son. Sometime during these years, Blanche also became the godmother to Ramon de Ocina, the young heir of two additional castles called Ocina and Castelfollit de Boix. From being the daughter of a middle-class merchant, Blanche was now the administrator of three castles, comprising hundreds of peasant families. She hired guards, directed private armies, had final say in all of the financial affairs of the lordships, and generally enjoyed more personal power than almost any man in the region. Around 1373, Blanche remarried again, this time to a knight named Johan de Grau, who was another prominent local landowner. Why did she remarry, and give up the nearly ‘supreme’ power that she had been enjoying for almost a decade? This might have been because her wards had now achieved their majorities, and were due to take over management of their castles. In the end, certain other family members sued Blanche for alleged mismanagement of their wards’ estates, but Blanche was able to settle out of court, and this should probably be seen as typical wrangling when large estates change hands. As wife of Johan de Grau, Blanche features in other documents relating to regional properties, and is last found defending her interests in an act of 1404—likely she was once again a widow, and exercising her rights as an independent economic agent free from any direct male control. 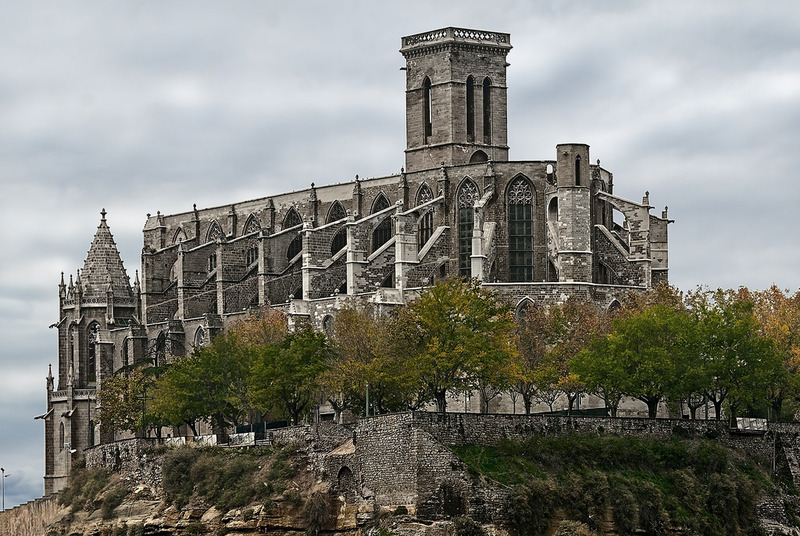 Manresa - Collegiate church and city walls. Photo by Miquel Fabre (https://www.flickr.com/photos/miquelfabre/29962360383). Talamanca Castle. Source: Wikimedia Commons. As Blanche’s career illustrates, one did not have to be a princess or queen in medieval Europe in order to become a regional power broker. While most women were not as lucky as Blanche, it says a lot that local Catalan society could tolerate so much legal and personal authority on the part of a local woman. And there is no reason to doubt that Blanche’s career was entirely normative in this society at this time. As we have already gone over our word limit for this piece, we will have to conclude. But suffice to say that we have attempted to show that a) medieval women in Western Europe could enjoy real economic and personal power, including effective power over many men; b) that this situation was relatively common and readily accepted by men and women in society; and c) we assert that, from what we can see, this type of situation was increasingly rare, even unheard of, as one moved into Eastern Europe, the Islamic world, and Asia. But then again, perhaps new research will reveal surprising findings about medieval women’s lives in these regions as well! The chance to make such discoveries is one of the main rewards of historical research, after all. 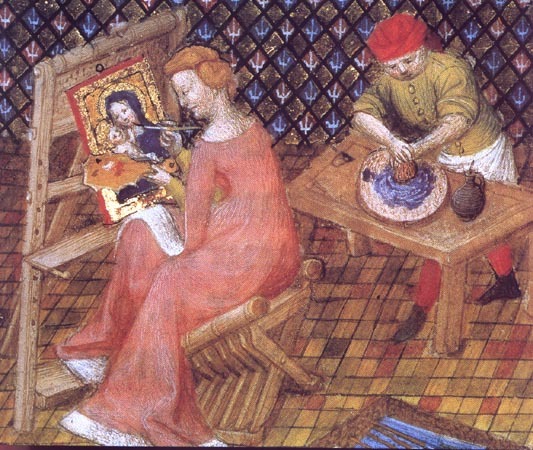 Female professional painter (detail of a miniature in a 15th century manuscript of De mulieribus claris). Source: Wikimedia Commons. © Jeff Fynn-Paul and Leiden Medievalists Blog, 2018. Unauthorised use and/or duplication of this material without express and written permission from this site’s author and/or owner is strictly prohibited. Excerpts and links may be used, provided that full and clear credit is given to Jeff Fynn-Paul and Leiden Medievalists Blog with appropriate and specific direction to the original content.